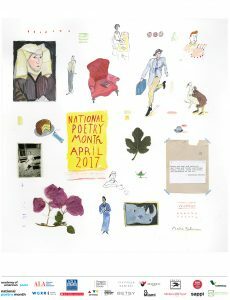 April is National Poetry Month, a celebration of the importance of poetry to our culture that the Academy of American Poets initiated in 1996. Why should we care about poetry, or, for that matter, any art form? Why do the arts matter? Why is the right to freely participate in the cultural life of the community, to enjoy the arts, as stated in Article 27, included in the Universal Declaration of Human Rights (UDHR)? Creative expressions have been part of the human experience as far back as 100,000 BC, according to the Metropolitan Museum of Art. Before language, art forms helped people convey information about their life experiences that continue to provide historical insights about past civilizations. Through time, the arts — poetry, music, movies, paintings, dance, theater, opera, and more — have enabled people to express ideas about life’s challenges —falling in or out of love, or other dimensions of being human, nature, politics, and world events — in ways that capture hearts and minds and inspire new ways of thinking. Page 7 of The World As It Could Be Program Curriculum outlines why we have the arts as an integral part of learning, in general, as well as of caring about the UDHR. We note that, among other valuable contributions, the creative arts make the abstraction of human rights real and help make the words in documents like the UDHR personally and culturally relevant. In 2013, with seven years of TWAICB experience as reference, I felt compelled to work on the Rex Foundation newsletter Perspectives on the Answer of Art, to help raise greater awareness about why the arts are vital to our human spirit, as well as the health and vibrancy of our communities. Mickey Hart, musician extraordinaire/former Grateful Dead drummer, and Sarah Crowell, Creative Director of Destiny Arts Center, offered inspiring insights. Think about the songs, poems, books, movies, photographs or other art works that have spurred your emotions and imagination, and consider how the arts have contributed to you personally. Let’s take National Poetry Month as a great opportunity to appreciate the value of poetry and the creative arts as a whole!